Tour du Canada receives support and friendship from members of local communities across Canada. There are many to thank but a few of note are the community of Youngstown, Alberta and Lake Ainslie, Nova Scotia which hold community-wide events to celebrate our arrival. In many small communities such as Terrace Bay, Ontario the town assists us with the challenges of finding suitable camping facilities. And of course our favourite lobster fisherman in Saint-Louis-de-Kent, New Brunswick, father of a TdC vet, delivers us fresh caught lobsters each year. Finally, we will be forever grateful to the people of the town of Nipigon, Ontario who came to our aid under the most challenging of circumstances. We greatly appreciate this kindness and hospitality and always strive to conduct ourselves in a similar manner. 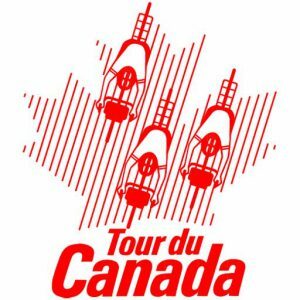 Tour du Canada organizes the Tour du Canada Bursary Fund which provides funds to help young people participate in the cross-country bicycle tour. We welcome contributors to this fund. Tour du Canada also supports the Canadian Kilometer Achiever Program (C-KAP) each year with an award to a C-KAP member who has traveled extensively, exploring Canada by bicycle (Tour du Canada distances are not included in the km count). And, each year, cyclists who have completed a coast-to-coast-coast rides across Canada receive the C3 Honours award. If you represent a cycling club and want a free text listing on the CycleCanada Directory will host your club’s web site for free, please e-mail : sweep@cycleCanada.com. This directory also provide free text listings to any bicycle shop in Canada.